Introducing the versatile Miele Swing H1. The Miele Swing can be configured in a number of ways to fit your cleaning needs. You can remove the Rug and Floor Tool and attach the Crevice Tool or Upholstery Tool to the Bottom of the Unit for handheld cleaning of crevices, stairs, upholstery and more. You can also remove the extension wand and attach it to the bottom to extend your reach to clean ceiling crevices or attach the Rug and Floor Tool to the wand to get a low profile to get under furniture and more! Believe it or not the Miele Swing H1 has so much power that sometimes it is necessary to reduce the power. With a built in suction control it is a snap to change the speed to suit your needs. The dustbag has a self-sealing opening that makes it easy and sanitary to change the bag. To insert a new bag just push the bag into the bag track and close the lid. Simple and Easy! No longer go searching for your tools in the closet. The included convenient tool caddy stores all of the tools right on the wands so they are always ready for use. This universal tool is ideal for all smooth flooring and very low pile carpeting. It allows you to go from smooth floors to carpeted surfaces with a quick click of the rocker switch. It is extremely lightweight and has a swivel neck so you turn around obstacles with ease. Carpets and rugs can be gently and thoroughly vacuumed. 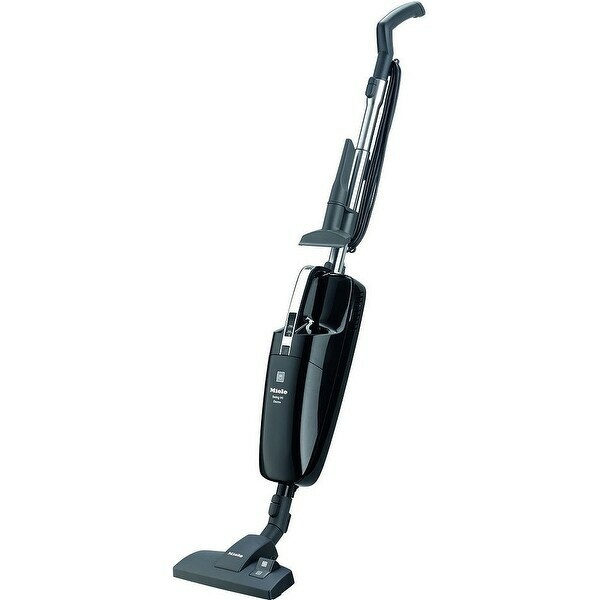 The simple, maneuverable design makes vacuuming quick and easy in tight spaces making this the perfect vacuum for small apartments, loft spaces, yachts, RV and campers. "Is this a free standing"